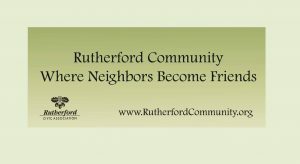 Families with young children may be wondering, “Is Rutherford a safe neighborhood to take my kids trick-or-treating?” The answer from my end of Kristin Lane is an unqualified YES! Rutherford is a very safe neighborhood for kids, and Halloween is one of the best nights of the year for our children to get to know their community better. Halloween is a magical night when we get to open our doors to give and receive warm, friendly greetings. We get to briefly see and interact with kids we don’t see the rest of the year. And children get to discover that behind the closed doors, their neighbors have kind and caring faces. Halloween is a time for kids to appreciate the breadth of their neighborhood, and most importantly, come to believe that their community is a good place to live in and get to know better as they grow. Another bonus: there is a true magic in being outdoors at night! I’ve heard some say that too many houses are dark on Halloween night. It can be a vicious cycle. Not as many kids come, so fewer neighbors choose to give out candy…. so fewer kids go out… and so on. Let’s keep this night vital and robust this year! Trunk-or-Treat and Fall Festival on Saturday the 29th are great events to kick off the Halloween fun, and the party continues on Halloween night with trick-or-treating around the neighborhood. I encourage parents to take their children, even the small ones, out at least on their own block.